Jack Shadbolt has long been recognized as an artist of international stature but his work has always spoken with a West Coast accent. His images of our landscape transformed through his artistic vision have had a major influence on the development of Canadian painting. Indeed, Jack Shadbolt is widely regarded as the pre-eminent living painter of Western Canada. Jack Shadbolt has given us a truly prolific body of work which has been featured in over 60 solo exhibitions and major retrospectives. Public recognition in the form of honorary doctorates from the University of British Columbia, the University of Victoria and Simon Fraser University, and the Order of Canada, attest to his accomplishments. 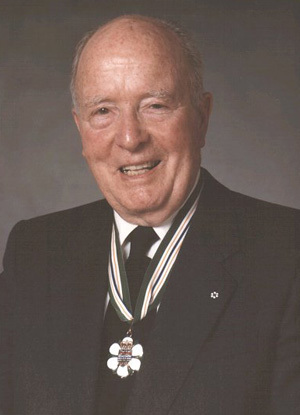 In 1989, on his 80th birthday, he was made Freeman of the City of Vancouver. Jack Shadbolt is equally to be honoured for his contribution as a teacher. From 1938 to 1966 he was a profound influence on his pupils at the Vancouver School of Art where he was known as a spell-binding lecturer and inspiring teacher. His role as a mentor of younger artists is well known and includes the establishment of the Vancouver Institute for the Visual Arts. He has also been prominent in support of the Children’s Arts Umbrella. His personal support and encouragement has been crucial to many young artists’ careers. Poet, author, teacher and mentor: Jack Shadbolt.